Veggies is a volunteer-led, community-based, social enterprise. 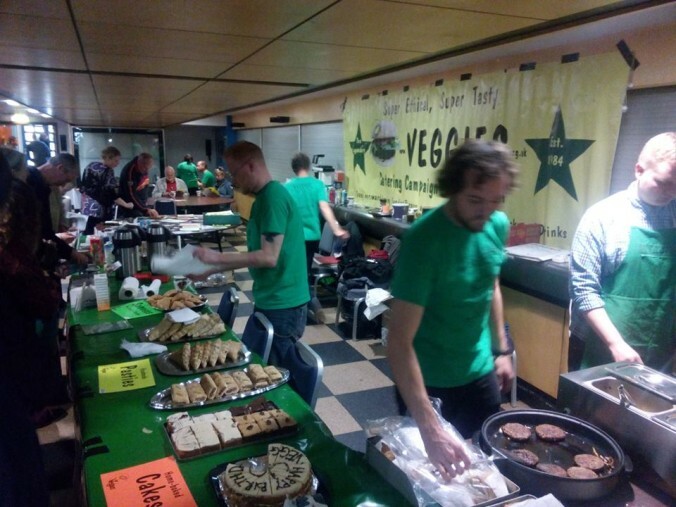 Veggies has been promoting vegan catering and supporting campaigns for human and animal rights, environmental protection and social justice since 1984. Partly due to our work, veganism is now widely understood as an ethical & sustainable way of living. Veggies Catering Campaign provides catering at almost any event – from campaign rallies to community festivals, from family celebrations to green gatherings. We offer tasty, wholesome snacks, favouring fairly traded, organically grown and/or locally sourced ingredients, as well as information exploring the links between diet, animal suffering and the environment. Veggies tour dates are listed, with full details, on our diary. More information on the what, why and how of our work can be found in the catering section. You can also follow @veggiesnottm on Twitter or VeggiesCatering on Facebook. We have a policy of minimal packaging and promote the use of recycled goods. We investigate everything that we use in order to avoid animal products, those tested on animals and those resulting from human oppression, whilst seeking guidance from the Ethical Consumer Magazine. Our Burgers, Sosages and Mixes are rated the ‘Best Buy‘ by the Ethical Consumer. Read more about our ethical policies. Many suppliers are other independent local businesses, including Screaming Carrot and Lembas Wholefoods. The ecological and vegan cleaning supplies that we use can be purchased directly from us on a retail, bulk or refill basis. 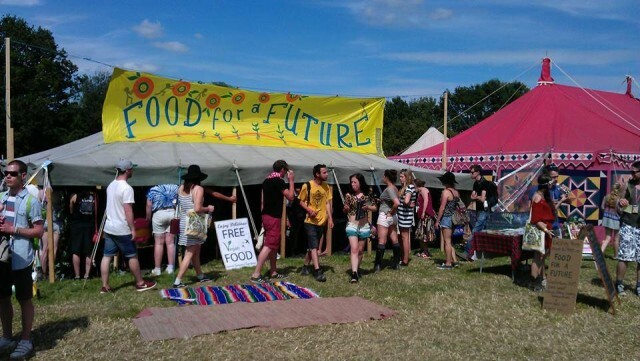 A directory of other caterers who might be able to help at events that we are unable to attend, is compiled by Veggies, complimenting the Vegan Business Connection, which supports groups promoting a healthy and compassionate lifestyle in other areas. Veggies is a workers’ co-operative, with three workers sharing one living-waged job. We aim to live simply so that others might simply live. 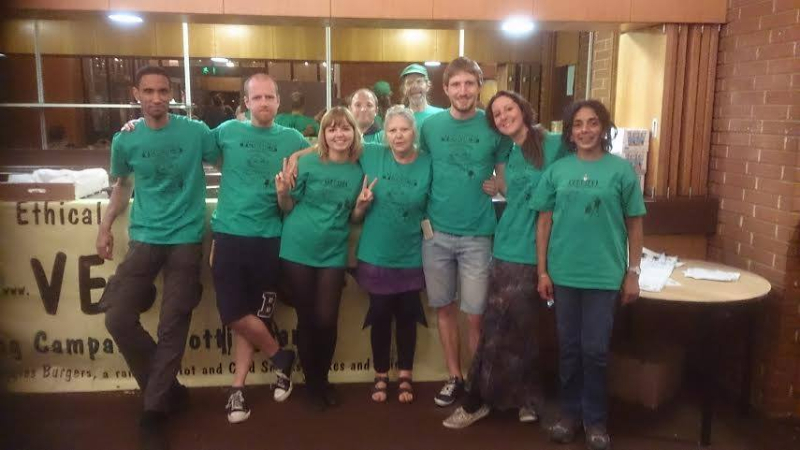 We are associate members of Radical Routes, the network of grassroots co-operatives working for social change and receive welcome support from a team of dedicated volunteers. Join us! Veggies are based at Nottingham’s Sumac Centre, the campaign resource centre part-funded by Veggies. Events that we are directly supporting are shown on Veggies Events Diary. 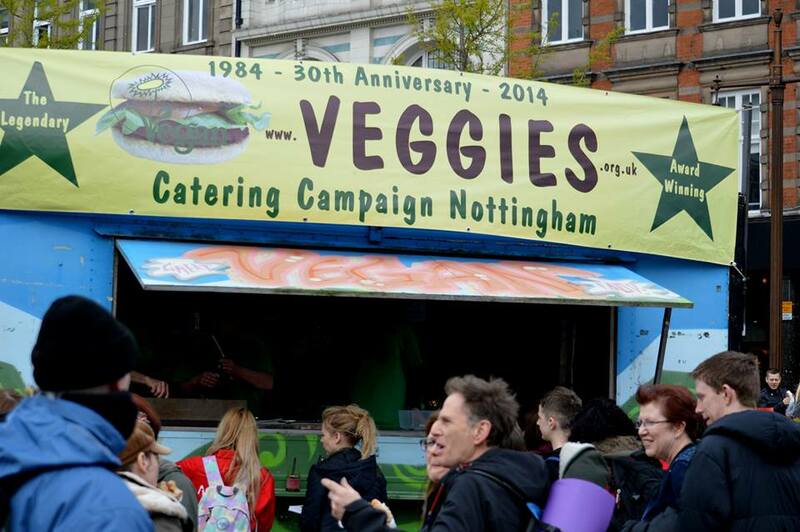 Veggies also compiles a diary of Community & Campaign events in Nottingham & beyond, including the UK Animal Rights Calendar and Vegan Outreach Diary. We have been networking for humans, animals and the environment for over 30 years, with details of many contacts gathered on Veggies Directory. Veggies distribute publications for the Movement for Compassionate Living, who promote simple living and vegan self-reliance as a remedy to the exploitation of humans, animals and the Earth. 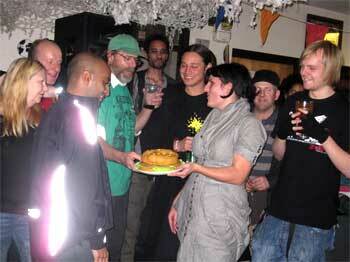 We are also local contacts for Animal Aid, the Vegan Society, the Vegetarian Society and Viva!. Many books and some 150 journals, which cover green, human rights, animal issues, anti-war, co-operation and social justice, are available from the Sumac Library and Veggies Bookstall. 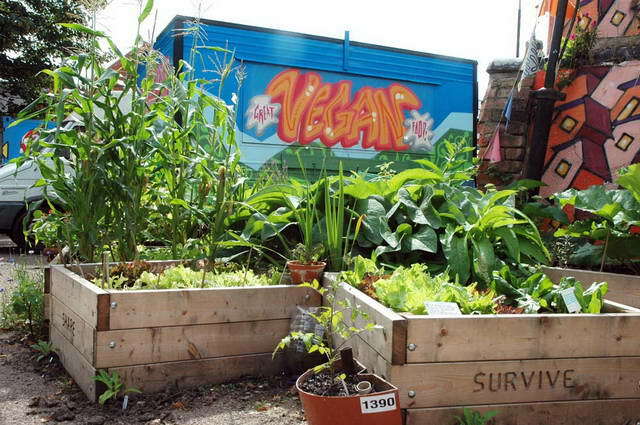 We help co-ordinate VegCom a free noticeboard for vegans and vegetarians offering or seeking accommodation in Nottingham and the Midlands, as well as the Community Print Resource, a d-i-y print shop. Many more projects supported by Veggies are shown in the Campaigns section of this website. If you find our extensive internet service useful, we welcome donations towards our online and networking expenses. Find Veggies of Nottingham on Wikipedia, Facebook and Twitter. Veggies is a service provider to many groups and individuals. The use by others of our address, telephone, website or other facilities does not imply that we approve of or condone any actions taken by these parties. Veggies and the Sumac Centre are not responsible for the actions, or the effects of the actions, of any third party.